Colm TÓibÍn on Joni Mitchell • James Wood on The Who • Stacey D'Erasmo on Kate Bush • Daniel Handler on Eurythmics • Lisa Dierbeck on the Pretenders • Clifford Chase on the B-52s . . . and other writers on the soundtracks of their lives. 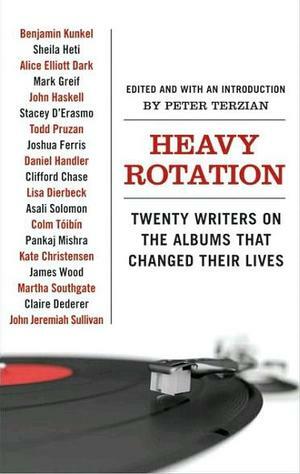 In Heavy Rotation, twenty of our most acclaimed contemporary writers pay homage to the record albums that inspired them. Benjamin Kunkel remembers how the Smiths' QUEEN IS DEAD transformed him into an adolescent Anglophile. Pankaj Mishra describes how a bootleg cassette of ABBA's SUPER TROUPER evoked a world far from his small Indian village. Kate Christensen relives her years as an aspiring novelist in Brooklyn listening to Rickie Lee Jones's FLYING COWBOYS. And Joshua Ferris recalls his head-banging passion for Pearl Jam's TEN. Exploring music from the Talking Heads to the HEDWIG AND THE ANGRY INCH soundtrack, this extraordinary anthology is a moving, funny, uplifting, and unforgettable celebration of the unique and essential relationship between life and music.